As IF we ever had any doubt – the ‘Hello’ star CLEANED UP at the BRIT Awards 2016. 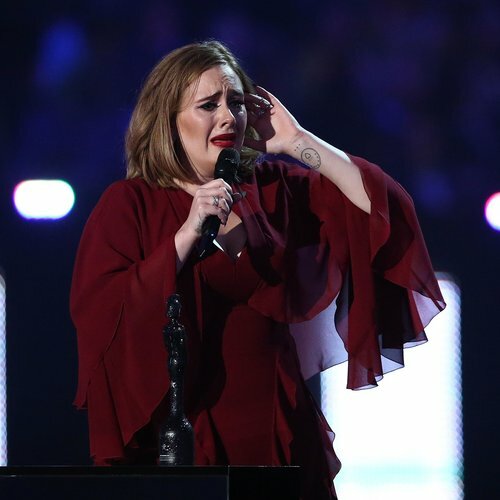 Adele is something of an unstoppable force in the world of music, so OF COURSE she ended up being one of the biggest winners at the BRIT Awards 2016 – scooping FOUR awards on the night! The ‘Hello’ star scooped the awards for Best British Single With Capital, British Album Of The Year, Global Success and British Female Solo Artist too. Rocking a stunning scarlet gown, Adele barely had time to take her seat between all the times she had to ascend the stage to collect her awards – and of course she accepted them in true Adele fashion! Collecting her award for British Female – her second in the same category, after winning it in 2012 – Adele picked up her statue from One Direction’s Louis Tomlinson and Liam Payne. Adele was also presented with the award for Global Success by astronaut Tim Peake, live from the International Space Station – which left Adele in buckets of tears at how cool her son Angelo would think she was! With a host of all the biggest and most prestigious awards under her belt already, Adele’s going to have to make some serious room in her trophy cabinet for these new ones!